Baby Geniuses is a 1999 American family comedy film directed by Bob Clark and written by Clark and Greg Michael based on a story by Clark, Steven Paul, Francisca Matos, and Robert Grasmere, and starring Kathleen Turner, Christopher Lloyd, Kim Cattrall, Peter MacNicol, and Ruby Dee. The film has the distinction of being the first full-length feature to use computer-generated imagery for the synthesis of human visual speech. 2D warping techniques were used to digitally animate the mouth viseme shapes of the babies which were originally shot with their mouths closed. The viseme shapes were sampled from syllables uttered by the babies on the set. The film grossed over $36 million worldwide. In 2004, it was followed by a sequel, Superbabies: Baby Geniuses 2. In 2011, an original series was announced. The series has so far aired in Italy and the Far East. Additionally, the series was released as a set of movies. Baby Geniuses and the Mystery of the Crown Jewels, which features episodes 1–4, was released directly to video in 2013. Episodes 5–8, Baby Geniuses and the Treasures of Egypt, came out in 2014, and episodes 9–12, were released as Baby Geniuses and the Space Baby in 2015. The series/movies follow the Baby Squad Investigators, or B.S.I., as they pursue Big Baby, his father Beauregard Burger (Andy Pandini), and the international thief Moriarty (Jon Voight). Baby Geniuses received overwhelming dislike from critics. It is also considered to be one of the worst films of all-time. Two scientists, Dr. Elena Kinder (Kathleen Turner) and Dr. Heep (Christopher Lloyd), use genius-baby studies to fund BabyCo's theme park "Joyworld". According to Dr. Kinder's research on toddlers/babies, babies are born possessing vast, universal knowledge and speak a secret yet impossible-to-translate baby pre-language called Babytalk. However, at age 2–3, the knowledge and language are lost as the babies cross over by learning how to speak human languages. Most of the babies raised in Dr. Kinder's underground research facility were adopted from the Pasadena City orphanage, transformed into little geniuses through use of the Kinder Method, and then used in experiments to decipher this secret yet impossible-to-translate language used by the 7 baby-geniuses. One mischievous toddler, Sylvester (the only one of her toddlers who was raised through use of the superior version of the Kinder Method), makes repeated attempts to escape Dr. Kinder's research facility and one night, Sylvester goes into a dirty diaper truck and he actually succeeds. The next morning, one thing Sylvester does not expect is to run into his long lost normal twin brother, Whit, in a mall playground. Although Sylvester and Whit share a telepathic bond, they have no idea of each other's existence. While the guards from Dr. Kinder's research facility capture Whit, mistaking him for Sylvester, and take him back to Dr. Kinder's research facility, Sylvester is taken home by Whit's adopted mother, Robin (Kim Cattrall), who is Dr. Kinder's niece. After Dr. Kinder and the six other baby-geniuses are shocked that Whit and Sylvester switched places at the mall, Dr. Kinder decides to do a cross evaluation on Sylvester and Whit. However, when she comes to Dan Bobbin's place, she realizes that Dan can understand babies. After the attempts to retrieve Sylvester fail, Dr. Kinder decides to move the research facility to Liechtenstein, and they have no chance but make Whit be the only normal baby to be raised in this research facility until they can find a possible way to get Sylvester back to her research facility. The babies at Bobbin's place hypnotize Lenny (Dom DeLuise), the bus driver to drive to Dr. Kinder's research facility. Once at the research facility, Sylvester goes to the control room to set the robots from the theme park on the lab scientists. When the Bobbins return home, their natural daughter Carrie tells her father that the children are in Dr. Kinder's research facility. At the end of the fight, Dr. Kinder captures Whit and takes him to the helicopter pad on the roof. Robin and Dan chase them to the roof, where Dr. Kinder reveals that she and Robin are not related and that Robin was adopted at age two. After Dr. Kinder is arrested by the police, Sylvester and Whit come together on the roof to cross over. Dan and Robin adopt Sylvester. And Dr. Heep is now in charge of Dr. Kinder's Research facility. Dan is still curious of the secrets of life; but, as the twins have crossed over, they no longer know those secrets. Carrie, their sister, doesn't reveal anything (just giving her dad a sly smile) because adults aren't meant to know their secrets. Dom DeLuise as Lenny, who is a janitor and sitter for Dan and Robin. Ruby Dee as Margo, Dan and Robin's housekeeper. Kyle Howard as Dickie/Ice Pick, a teenage guru of the clan in Dan and Robin's family. Review aggregator Rotten Tomatoes reported that 2% of critics gave the film a positive review, based on 44 reviews. Its final consensus reads: "Flat direction and actors who look embarrassed to be onscreen make Baby Geniuses worse than the premise suggests." It was listed by leading American film critic Roger Ebert as one of his most hated movies and ranked as his worst film of 1999. The film received a normalized score of 6 out of 100 on Metacritic based on 14 critics, indicating the reviews as "overwhelming dislike". The film made over $5 million in its opening weekend, and was the 10th highest-grossing PG-rated movie of 1999. 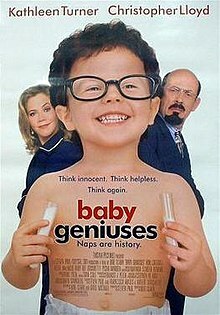 Although the film was not received well by critics, a sequel was made, titled Superbabies: Baby Geniuses 2, due to its commercial success on home video. The sequel, like the original, was directed by Bob Clark and is widely considered among the worst films of all time, and received worse reviews than the original. ^ "Baby Geniuses". British Board of Film Classification. Retrieved January 20, 2017. ^ "Detail view of Movies Page". afi.com. Retrieved July 31, 2015. ^ "Baby Geniuses 3: BSI (Baby Squad Investigators)". Minerva Pictures. ^ "Baby Geniuses Reviews". Rotten Tomatoes. Archived from the original on August 29, 2010. Retrieved September 5, 2010. ^ "Baby Geniuses Box Office Totals". Box Office Mojo. ^ "Baby Geniuses Yearly Chart". Box Office Mojo. ^ "1999 22nd Hastings Bad Cinema Society Stinker Awards". Stinkers Bad Movie Awards. Los Angeles Times. Archived from the original on October 17, 2006. Retrieved May 10, 2013.